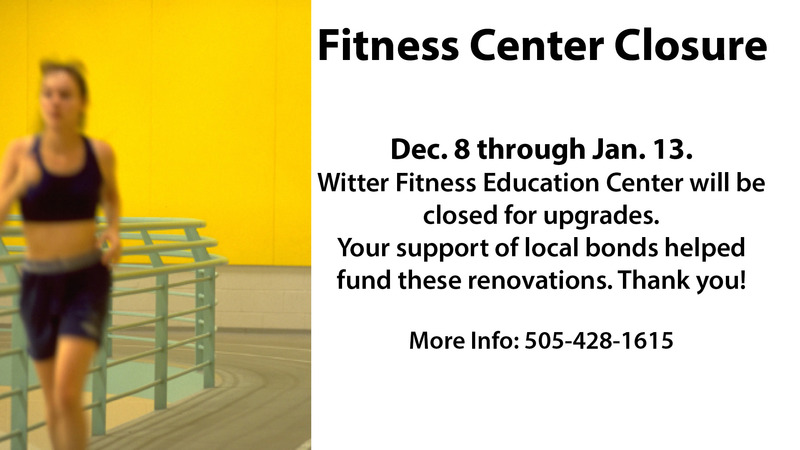 SANTA FE, NM – Santa Fe Community College’s William C. Witter Fitness Education Center’s recreation facilities will undergo major renovations beginning in December. The gymnasium is scheduled to be closed for floor repairs and refinishing Monday, Dec. 3, 2018 through Tuesday, Feb. 5, 2019. The entire facility is scheduled to be closed Saturday, Dec. 8 through Sunday, Jan. 13, 2019. SFCC holds it fall graduation on Dec. 8 at the Fitness Education Center and will be closed to fitness patrons. Improvements and repairs to the facility will include flooring, furniture, resistance-training equipment, exterior stucco and light fixture replacements. The community’s support of the local bonds are funding the renovations. For more information contact the Fitness Education Center at 505-428-1615.